Maybe it was the October snowstorm or perhaps it was the underwhelming, belated Halloween, but the two best holidays have snuck up on me out of nowhere! 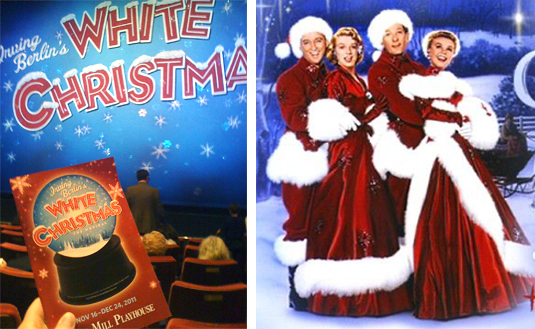 To recapture the holiday spirit it is important to keep traditions alive, be it red cabbage at the Thanksgiving table or the annual viewing of White Christmas. Some families swear by a Christmas Story or It's a Wonderful Life, others partake in the hilarity that is Christmas Vacation, but for the Talbot family the holiday requires a little song and dance from the Yuletide crooner himself, Mr. Bing Crosby. As luck would have it, the tradition came early this year, just in time to bump me back into the spirit of the season. Yesterday, me and the folks spent the evening at the theater (can anyone read "the theater" without a pretentious British accent?). 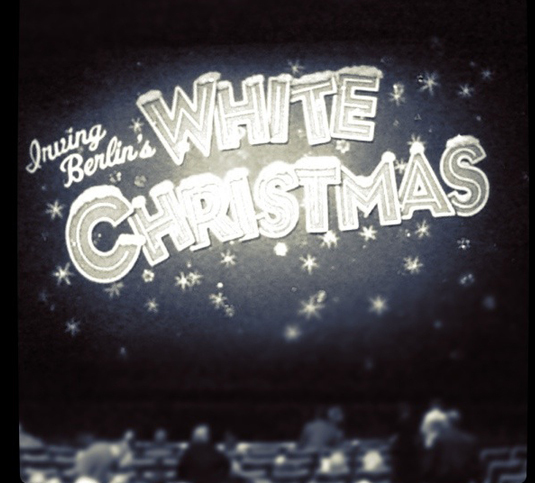 Although a bit premature, the local playhouse put on a fabulous production of Irving Berlin's White Christmas, including the prerequisite fake snow and group singalong. A few numbers were missing, others added, but all in all the play was a festive way to spend a Thursday evening (Thanks Dad!). Of course I will have to watch the cinematic gem in it's original format closer to the big day; nobody can beat out Bing and I was so sad to see both "Mandy" and "Choreography" not make the set list. Here's to the start of a wonderful holiday season! Finally back up and running after a week without power, heat, cable, or internet. 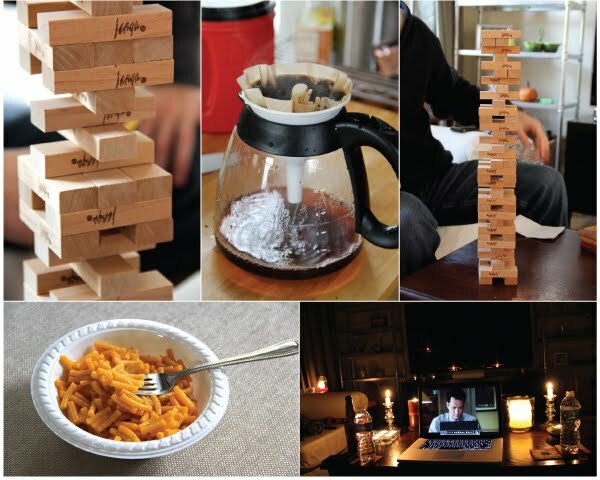 Our only saving grace was a gas stove and water-heater! 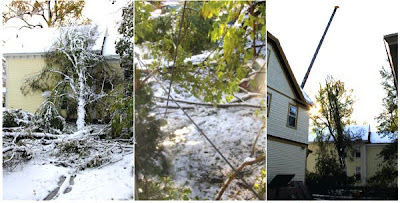 Around 10 pm Saturday, October 29th I watched as a tree took down all lines to our house. It was exciting yet scary as sparks flew from the cables and darkness and silence fell upon us. After taking a closer look we realized we didn't have it as bad as our neighbors. As our tree fell onto our driveway another tree fell on the house next door! Happy to report we made it through the week and we hope it never happens again! 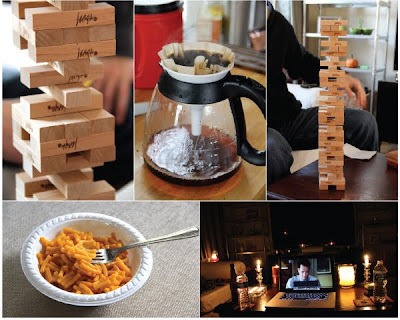 Survival: We stuck to stove-top meals (mac n' cheese), Jenga, candles, DVDs, reading, and coffee/tea on the stove. Is it Halloween or a White Christmas? This weekend's freak storm made for one dark and cold All Hallow's Eve, and left this Autumn-loving girl feeling a bit out of place. With no functioning oven to bake up something pumpkin to put me back into the correct time of year, I've decided to regale you with a more season appropriate endeavor. After whipping up the requisite apple bars and apple bread this past October (sorry but these recipes are kept under lock and key) I had plenty of excess apples ripe for the juicin'. 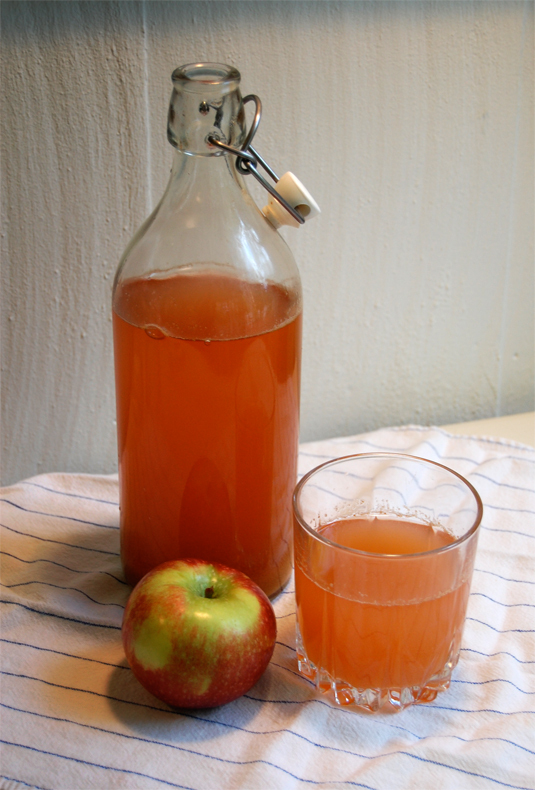 Who needs to buy cider when you can buzz up your own batch with a juicer? About 24 apples, two messy sieves and one huge mess of pulp on the kitchen counter was all it took to make this bottle of deliciousness. Not quite cider and not far from juice, the resultant liquid tasted as it should, like eating a fresh picked apple. The flavor was bright and tart, the color a pinkish brown and the result well worth the effort. If you have a juicer and apples on the cheap, it's a must try.